In the fall of 2017, Rideau Carleton Raceway in Ottawa joined Ontario’s Standardbred Alliance, combining forces with ‘Grassroots’ tracks Clinton Raceway and Hanover Raceway, ‘Signature’ tracks Flamboro Downs, Georgian Downs, Grand River Raceway and The Raceway at Western Fair District and ‘Premier’ tracks Mohawk Racetrack and Woodbine Racetrack. At the same time, Rideau Carleton also reacquired the services of race caller Dave Schreiber and things have been working out well on both fronts ever since. Courtesy Rideau Carleton | An artist’s rendering of the new video tote board the Ottawa track hopes to install soon. Courtesy Dave Schreiber | Rideau Carleton race caller Dave Schreiber broadcasting an Ottawa Senators NHL game at the Canadian Tire Centre in the nation’s capital. In its first year as a member of the Alliance, which merged with Ontario Racing in late 2017, Rideau Carleton increased its average handle on live racing cards by more than 12 per cent and laid out plans for a series of capital upgrades that will be complete this spring. For his part, Schreiber shook off two decades of rust and reconnected with a sport that first got into his blood in the late 1960s when Ontario Jockey Club announcer Daryl Wells encouraged him to try his hand at calling races. In 1974, Schreiber was hired by an Ottawa radio station and made the move east. One of his duties was calling Ontario Hockey League games for the Ottawa 67s, and as luck would have it, his arrival coincided with that of coach Brian Kilrea, who would spend 35 years with the club and become the winningest coach in the history of the Canadian Junior Hockey League. In a career not lacking for highlights, calling the Ottawa 67s 1999 Memorial Cup win on home ice tops Schreiber’s list. He was on the microphone for all eight games of the four-team tournament that saw the host team score a 7-6 overtime win against the Calgary Hitmen in the final. 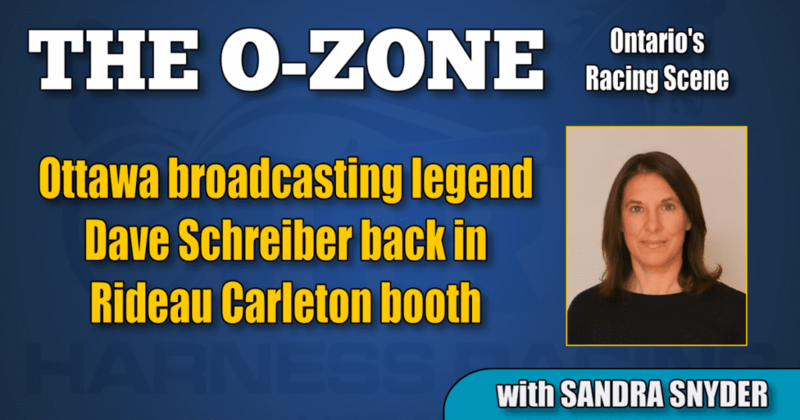 In the early 1980s, in addition to criss-crossing Ontario on the Ottawa 67s bus, Schreiber took on the job of back-up announcer at Rideau Carleton, learning to call the standardbreds from Des Smith. When Smith passed away in 1981, management asked Schreiber to step into the full-time announcer’s role, and the broadcaster agreed. For the next decade, Schreiber balanced his day job at the radio station with calling junior hockey games and announcing at Rideau Carleton five nights a week. Among the highlights of his first stint in the Rideau Carleton booth was the night Cam Fella scored win number 27 in the 28-race win streak he amassed during his 1983 4-year-old campaign. In 1992, Schreiber added the Canadian Football League’s Ottawa Rough Riders and the city’s new National Hockey League team, the Ottawa Senators, to his list of radio broadcast responsibilities and soon found that he could no longer balance football, hockey and horse racing with his day job. After stepping away from Rideau Carleton the broadcaster — dubbed “The Voice” by then Ottawa 67s player Jim Ralph — handled the play-by-play for the Rough Riders until their demise in 1996, covered their replacement, the Ottawa Renegades, through their 2002 to 2006 tenure in the nation’s capital, and was part of the Ottawa Senators on-air team until 2014. Among his favorite memories from those decades are handling the national radio broadcast for two CFL Grey Cups, 2001 in Montreal and 2002 in Edmonton and calling Ottawa Senators captain Daniel Alfredsson’s 400th goal on Dec. 31, 2011. In 2015, Schreiber was inducted into the Ottawa Sports Hall of Fame, joining Brian Kilrea and Des Smith who were inducted in 1990 and 1985, respectively. When he got the call from Rideau Carleton Raceway racing manager Peter Andrusek two years ago, Schreiber was not sure if he still had what it took, but with some free time on his hands — he was only calling the Ottawa 67s home games at that point — he decided to give it a try. His initial concerns were quickly laid to rest as he settled back into the role and the unique demands of calling harness racing through an Ottawa winter. Rideau Carleton races every Sunday night from the second week of February through the last week of December and adds Thursday nights from the second week of June through the last week of November. The schedule is the most notable difference between Schreiber’s first and second stints in the booth, but he also points to the inside passing lane, increased speed and off-track wagering as significant changes from the mid-1990s. Schreiber acknowledges the difficulty Ottawa-area horsepeople have had making a living with the reduced schedule, noting that many of them also travel to Kawartha Downs when the Peterborough oval opens in May, but says there are a number of positives on the horizon. In addition to the new toteboard, visitors to the Ottawa oval will also appreciate the arrival of a new starting car while simulcast viewers enjoy some HD upgrades. Schreiber, who finally retired from calling junior hockey last season, expects to be in the announcer’s booth for the foreseeable future.